Like he did with A Praying Life, Paul Miller once again has given us a book that doesn’t fit the mold. This is not just any old book on Christian love. This book turns love inside out and gives hope and help to readers at all stages of their Christian life. A Loving Life: In a World of Broken Relationships describes the perils and pitfalls, as well as the promise and pleasure of love. Republished, with permission, from Voice magazine, Jul/Aug 2013. Several years ago, the philosophy department at Franklin & Marshall College invited me to be a featured guest on a panel discussing gay marriage. They wanted to pick up on the significant community focus on a column I wrote for our local newspaper. In a large room of full of college students, professors and community people, I was drilled with questions and comments for two hours. The panel included a professor from a liberal seminary, a visiting law professor (whose lesbian partner was in the audience), a gay German professor and a liberal campus minister. God granted me grace the entire evening to patiently respond with kindness to those who questioned me. The students were exceptionally polite but a bit confused as to why I would be opposed to gay marriage. The professors were rude and belligerent. The evening ended with the German professor looking over at me and asking how I could respect him if I consider him immoral for being gay. Although panelists were not directing questions at each other, I assured the professor that I would always treat him with the utmost respect as a fellow human being even if I disagreed with his sexual behavior. After the event concluded, about 20 students remained to discuss my views with me for another hour. 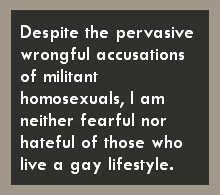 Despite the pervasive wrongful accusations of militant homosexuals, I am neither fearful nor hateful of those who live a gay lifestyle. But the popularity of such accusations makes it important for us to tone our debate and discussion with true concern and compassion. When we place the discussion in the general context of sexuality, we find important perspective for shaping the tone of debate. Love. It’s a small word with great potential. Its absence is destructive but the effects of its presence are incalculable. But what is it? Is it a feeling or an action? If an action, what does it look like? Where does it come from—from within, or without? "So: if we speak the truth, but without love, we won't grow. And if we love, but are not truthful, we won't grow." Read more about "So: if we speak the truth, but without love, we won't grow. And if we love, but are not truthful, we won't grow." http://online.worldmag.com/2011/08/12/when-christians-hate/ It would be something laudable... if elders and pastors combed the list of Facebook entries on Fox News’ page and, should they spy any of their congregants among the hateful, hold them accountable. 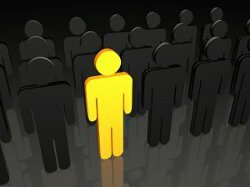 It is evident that leading neo-evangelicals believe that our main goal is to eliminate doctrinal distinctives and to emphasize unity among those claiming to be believers. One of the basic ideas of today’s philosophy of ecumenical evangelism is that love is more important than doctrine. Ecumenical evangelists say that doctrine divides, whereas love unifies. What does the Bible say? Is it true that in the New Testament love is more important than doctrine, or truth? In the so-called “love chapter,” we are told: “Now abide faith, hope, love, these three; but the greatest of these is love [agape]” (NKJV, 1 Cor. 13:13). Some say—“That settles it: love is supreme!” But when we examine this chapter more carefully, we discover that truth is also mentioned. In v. 6 we are told that love “rejoices in the truth.” In other words, faith, hope and love are virtues, but truth has an altogether different status. It is the frame of reference, the foundation, the atmosphere without which virtues such as love cannot exist at all. Love “rejoices in the truth.” Why? Because without truth to define, interpret, protect, guide and channel it, love can become a total disaster. We dare not place truth on the same level as virtues. Virtues would shrivel up and die if it were not for truth. Here is an example from the natural world. We cannot imagine life on this planet without water. Water is absolutely essential for life—as long as it stays within proper channels, such as canals, aqueduct and pipes. But when water gets out of control, it is the second greatest catastrophe that can happen to this planet—second only to fire. On the one hand, it is an absolute blessing, but on the other hand it can be a total disaster. So it is with love. It is an all-too familiar story. A pastor was forced to resign from the church when his affair with a staff member came to light. Another church was devastated. Another set of believers, both young and old, was left to wonder what had happened to the man they had loved and followed—a man who had led many of them to the Lord, baptized their children, conducted their weddings, visited them in hospital and prayed with them for their needs. There was no question of his guilt; the actions were admitted and indefensible. But many longed for an explanation. Why did it happen? How did it happen? The temptations to sin that we face are as numerous and varied as devilish ingenuity and human depravity can conspire to concoct. And after the fact, the explanations, rationalizations and excuses are as varied and numerous as those sins. But if we take the Scripture seriously when it promises that along with each temptation comes “a way to escape” (1 Cor. 10:13), each sin indicates a failure on our part. I believe that, in the final analysis, all sins spring from twin failures—a failure of fear and a failure of love. “By mercy and truth iniquity is purged, and by the fear of the Lord men depart from evil” (Prov. 16:6).